The Tecsun PL-398MP. Photo courtesy of the Tecsun Forum. 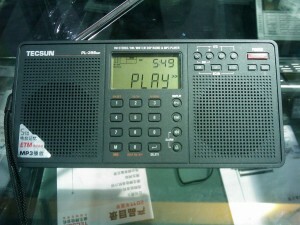 The Tecsun PL-398MP is a portable DSP-based shortwave radio. Its predecessor is possibly the Tecsun PL-390. It is certainly a familiar Tecsun design and layout–ergonomics appear to be in-line with their current models. The biggest new feature on the (future) Tecsun PL-398MP is the implementation of an MP3 player. Initial rumors suggested that the PL-398MP would be able to record as well–unfortunately, this is not the case. There are other shortwave radios on the market with an MP3 feature, but none of them are above average receivers. Tecsun has shown a history of producing radios that perform at the top of their price bracket–one would assume this to be true of the PL-398MP. MP3 playback capabilities via built-in SD card slot. Built-in SD card slot for removable storage. This entry was posted in MP3, Portables, Tecsun and tagged PL-398MP, Tecsun, Tecsun PL-398MP. Bookmark the permalink.